Murray Ivory Tropical Oasis Area Rug Rug Size: Rectangle 8'6" x 11'6"
Tropical Oasis African Mango. Description: Specially formulated to promote weight loss and heart health. CoQ10 Enzyme. Red Rice Yeast 4:1. L-Argenine. GMP Certified. Disclaimer These statements have not been evaluated by the FDA. These products are not intended to diagnose, treat, cure, or prevent any disease. Murray Ivory Tropical Oasis Area Rug Rug Size: Rectangle 5'3" x 8'3"
Murray Ivory Tropical Oasis Area Rug Rug Size: Rectangle 3'6" x 5'6"
Murray Ivory Tropical Oasis Area Rug Rug Size: Round 7'6"
Murray Ivory Tropical Oasis Area Rug Rug Size: Rectangle 7'9" x 9'6"
Murray Ivory Tropical Oasis Area Rug Rug Size: Round 5'6"
You try to get all the vitamins and minerals you need through a healthy and balanced diet and you know they are important to stay healthy. Unfortunately, busy schedules bring processed foods, and even our fresh foods have diminished nutritional value. Because vitamins and minerals are so essential for many processes in the body, most health professionals recommend a good multiple vitamin and mineral supplement to meet your body's daily requirements. A good multiple vitamin means one that is made with quality, natural ingredients that your body can absorb. Not all multivitamins are created equal! 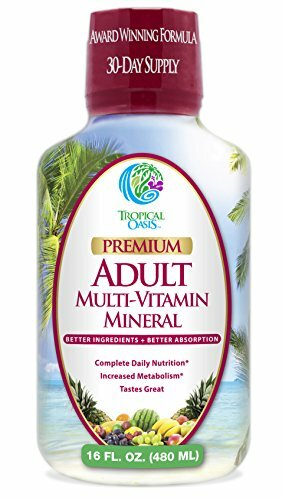 Our pure, glass bottled, highly-absorbable vitamin and mineral supplement is formulated to make sure you do get the vitamins and minerals needed to maintain healthy mind and body. Tropical Oasis Premium B-Complex Liquid is a potent specialized b-complex vitamin that contains the full line of 8 B Vitamins Plus an added blend of 9 energy maximizing herbs including Eleuthero Root, Ginkgo Biloba, and Panax Ginseng Take a Liquid Vitamin for Maximum Absorption Our liquid formula is easy-to-take, tastes great and most importantly it works better! Because liquid can be absorbed into your bloodstream bypassing digestion, liquid vitamins are up to 5x more affective than pills, and provide up to 96% absorption rates! 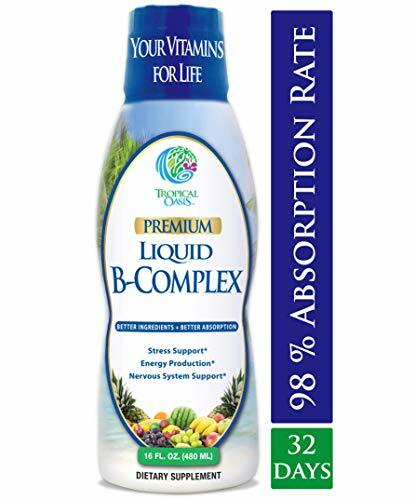 Benefits of Liquid Vitamin B-Complex Our liquid vitamin B complex blend promotes energy metabolism (converting food to energy), immune function, and nervous system health. Some other benefits of B-complex vitamins include cardiovascular support, healthy hair and skin, muscle growth, and red blood cell formation. Why add 9 Energy Maximizing Herbs? Better question is why not!? We strive to not only offer customers the best liquid vitamins on the market, but also provide them added benefits not normally found in standard vitamin blends. By adding Eleuthero Root, Ginkgo Biloba, Panax Ginseng, and 6 other herbs our B-Complex vitamin blend is sure to provide you with added energy not normally received from just a standard blend of vitamin b complex! In addition to energy, these herbs are also known for improving focus and cognitive function which is a benefit most people using b-complex vitamins are already looking for! Get Your Sunshine in a Bottle Today! Vitamin D3 is a vital nutrient that many adults our lacking in their diet without even knowing. Vitamin D3 Deficiency can often lead to laziness, weakness, moodiness, and deteriorating bone and muscle function. D3 in liquid form is the most potent effective way to give your body the D3 it needs! 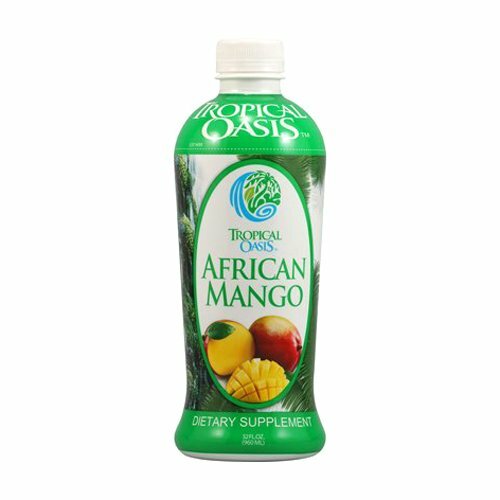 Tropical Oasis Liquid Vitamin D3 is a great tasting highly potent formula containing 5000IU per serving. 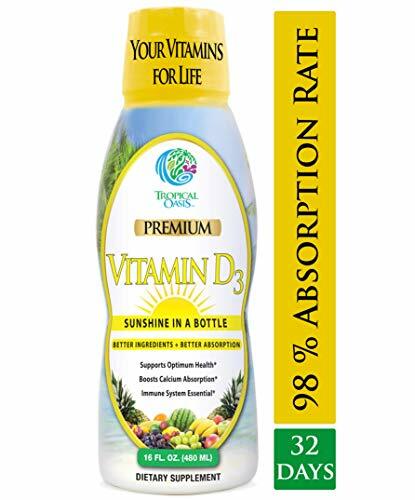 Vitamin D3 in Liquid Form is absorbed faster and more effectively than pills. With up to a 96% absorption rate by your body, compared to a 15-20% absorption rate for D3 in pill form. 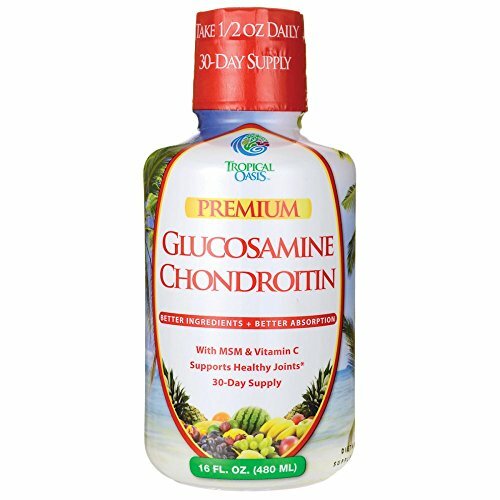 Tropical Oasis Liquid Calcium Citrate and Magnesium is a supplement that your body can use. Buying dense calcium pills that your body can't process and absorb is worthless to your body and a waste of your money. Calcium deficiency results largely from poor absorption. You may intake enough calcium, but if your body can't absorb it, you can still become deficient. Remember that your body can only absorb minerals that are "ionized." Remember that your body can only absorb minerals that are "ionized." What are ionized minerals? Ionized minerals are the ions released from minerals when the minerals are exposed to water. And it is only these released ions, or "ionized" minerals, that cells can adequately absorb and utilize. If the minerals you take go through your body as a solid without becoming exposed to water and ionizing, it simply passes through your body. 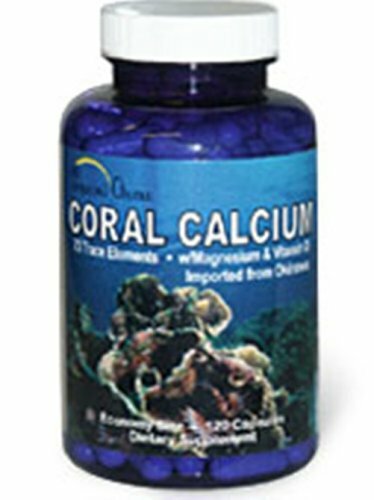 Tropical Oasis Calcium Magnesium supplement is already in liquid form thus much easier for your body to absorb. Why vitamin D? We include vitamin D in our formula because studies show that your body needs vitamin D in order to absorb the calcium. If you do not spend a lot of time in the sun, you may not get the Vitamin D you need. Now days due to the risks of skin cancer associated with sun exposure, many of us avoid the sun and our levels of vitamin D can decrease. Tropical Oasis Sleep a Weigh helps your body rebuild muscle, increase metabolism, and fight aging, all while you sleep! Collagen is a structural protein that forms your body's connective tissues including tendons, ligaments, muscle, and cartilage, which your body repairs and rebuilds while you sleep. It is is also a nutrient that helps give additional thickness and strength to your skin, hair and nails. Additional thermogenic ingredients L-carnitine and L-lysine help boost metabolism. To help fight aging, the Sleep a Weigh formula also includes aloe vera, applecider vinegar, Tonalin CLA, vitamin C and B6. 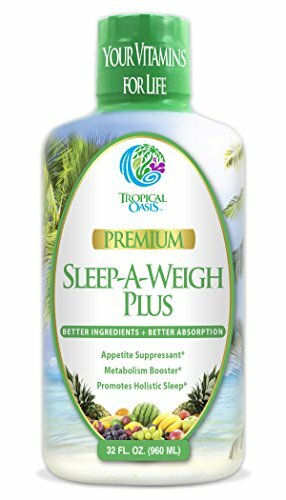 Tropical Oasis Sleep a Weigh is a well-balanced weight loss and health aid for a successful diet and exercise program.